Historically tin-leaded solder has been typically used in joining material in electronics manufacturing. However, due to environmental awareness and health concerns (related to the leaching of lead from land fills into ground water) legislation was developed and a restriction for the use of lead in electronics manufacturing was initiated. For this reason, an alternative to leaded solder paste was was researched. Alternatives to leaded paste were both tested and researched and after comprehensive studies- lead-free tin-silver-copper (or SAC) solder paste was voted as the preferred soldering paste for the electronics assembly industry. With this idea in mind and with the use of superior breakthrough technology, Kester developed it's lead-free soldering paste solution: Kester NXG1 Soldering Paste. Unlike other SAC lead-free, no-clean solder pastes, Kester NXG1 is seen as superior in that it has the widest reflow process window available. NXG1 provides the smoothest and seamless joints of any lead free paste on the market, and the difference from SNpB alloy to lead-free is crystal clear. Additional characteristics outlined below will absolutely make the transition to lead-free easier on users both individual users and contract manufacturers alike. Ultra-low BGA Voiding: Low void performance is a must for most assemblies today reducing rework and costs and improving first pass yields. Reduced Ball-in-socket Defects: Designed specifically to reduce or fully eliminate the occurrence of ball-in-socket (also known as "head-in-pillow" and "foot-in-mud) defects. Excellent Printability: Consistent solder paste volume deposits regardless of idle time, stencil life and print speed. This is the most important characteristic of any solder paste, as print volume inconsistency is the top cause of defects in electronic assembly. Excellent print definition and bridging prevention due to its non-slumping chemistry. The solder brick maintains its shape without variation over time. This attribute avoids bridging especially in fine-pitch components, saving the customer from wasting time and money on rework. Longest Shelf Life: NXG1 has the longest shelf life, at 8 months, of any lead-free, no-clean paste on the market. A longer shelf life will help reduce scrap and waste while allowing for more manageable inventory. Clear, Probeable Residues: The lightest colored residues of any paste in its class. Increased re-flow temperatures required by lead-free assembly tend to char, darken, and harden post-soldering residues. NXG1 offers best-in-class residue appearance and penetrability making AOI and manual inspection effortless. 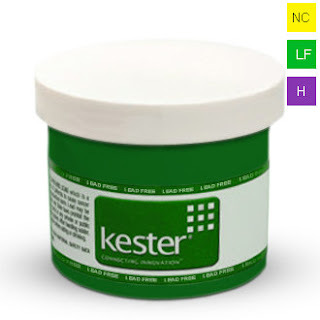 For more on this information on Kester NXG1's industry classification, silver chromate paper test, corrosion test, spot test, halide test, reliability amongst all other inclusive data see the Kester Paste guide by clicking here. Your project does not end when you stop making it, it ends when it is properly disposed of. Kester NXG1 Lead-Free Solder Paste: an environmentally friendly, electronic manufacturing solution. Available in both 500 gram jars and 600 gram cartridges.